"When people consider errors in judgment and decision making, they most likely think of social biases like the stereotyping of minorities or of cognitive biases such as overconfidence and unfounded optimism. 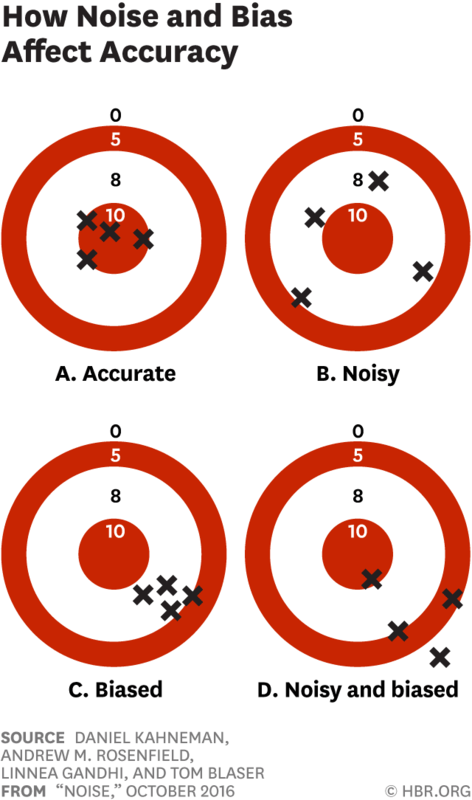 The useless variability that we call noise is a different type of error. To appreciate the distinction, think of your bathroom scale. We would say that the scale isbiased if its readings are generally either too high or too low. If your weight appears to depend on where you happen to place your feet, the scale is noisy. A scale that consistently underestimates true weight by exactly four pounds is seriously biased but free of noise. A scale that gives two different readings when you step on it twice is noisy. Many errors of measurement arise from a combination of bias and noise. Most inexpensive bathroom scales are somewhat biased and quite noisy."